Pasta, vegetables and cheese are a classic combination but the trick is to use a good mature cheese. This dish uses Waitrose West Country Farmhouse Mature Cheddar from Denhay farms. It is typically matured for 10 to 12 months to deliver a fuller depth of flavour. Preheat the oven to 200°C, gas mark 6. First make the cheese sauce by melting the butter in a saucepan and stirring in the flour. Cook for about 1 minute then remove from the heat. Whisk in the milk a little at a time until the sauce is smooth. Bring to the boil and continue cooking for a further minute or until the sauce has thickened, stirring all the time. Remove from the heat and stir in the mustard and half the grated cheese until melted and smooth. Season to taste. Bring a large pan of lightly salted water to the boil. Add the pasta and cook according to the pack instructions. About 5 minutes before the pasta is ready add the broccoli florets to the pan. 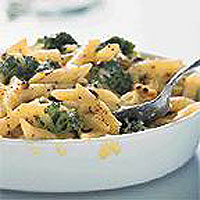 Drain the pasta and broccoli together and shake off excess water, arrange in a 2 litre gratin dish and pour over the cheese sauce. To toast the pine kernels place on a baking tray under a hot preheated grill, until just starting to change colour. Sprinkle the top of the bake with the toasted pine kernels and remaining cheese. Bake for about 15 minutes until golden and bubbling. Serve with a crisp green salad. This recipe was first published in February 2001.